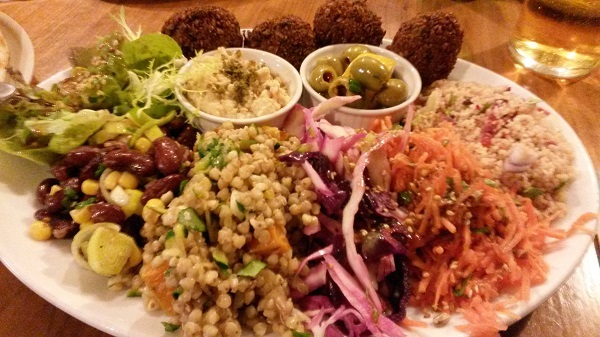 Bristol is one of the best places in the country to be vegetarian or vegan. Restaurants all over the city really seem to have the cuisine sussed, whether they serve meat or not. Restaurants where a vegetarian’s only choice is a mushroom risotto – and vegan’s only choice is a side salad – are becoming fewer and further between. There are, however, a handful of restaurants and cafes that are dedicated to serving entirely meat-free fare, and this article serves to give these the credit they so well deserve. Café Kino is a stalwart of the Bristol vegan scene, recommended by everyone from Veganbristol.com to Buzzfeed! Its vegan burgers are widely recommended but my favourites are the ‘BLT’ sandwich and the falafel. Kino also serves a wide range of gluten-free cakes. This bike-shop-come-café is as effortlessly hipster as they come – and the food is a good as the venue is cool, from the egg and halloumi breakfast roll to the flatbreads and salad platters. Everything’s veggie and vegan options are clearly marked. The coffee is a cut above average too. The best choice for a fancier evening meal. In the daytime the Maitreya menu is all about breakfasts, burgers and burritos, but in the evening the menu takes an upmarket turn. The smoky parsnip, cashew and aubergine roulade is superb, as are the cherry and almond samosas. Book ahead to avoid disappointment. Tucked away in Old Market, Fi Real offers a plant-based twist on Caribbean food, such as jerk or escovitched tofu and Jamaican Quorn curry, along with staples such as rice ‘n’ peas. Look out for the regular offers on the Wriggle Bristol app. While ‘who does the best falafel’ debates rage between lovers of Edna’s Kitchen and Eat A Pitta, the Falafel King has stood firm as Bristol’s original chickpea peddler. The café on Cotham Hill is a vegetarian Middle Eastern delight, serving falafel and sabich, and as well as mezze and salads. Like the sound of these? Then you should also look out for pop-up evenings from Spotless Leopard, Sky Kong Kong and The Mighty Food Fight, Hunkimori and Gopal’s Curry Shack. Kim is a vegetarian of 15 years, and has lived in Bristol for five. She blogs at bristolvegetarian.tumblr.com and tweets as @BristolVeggie. 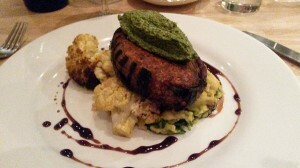 Please can you update your 5 best vegetarian restaurants page as it is way out of date as are the blogs mentioned at the end of it. Being a lifelong vegetarian I look forward to you doing this. Thanks.